Your figure tips are so helpful. Thank you, thank you for the bellydance costume design tips! I have a new figure problem for you to tackle, O Great One. Due to genetics, love of pasta, and lack of concentrated exercises, the backs of my upper arms are flabby! As soon as I put my arms up, gravity does its work and I have two half-moons of flabby flesh flapping in the breeze. How can I keep the focus on my wiggling hips, not my jiggling jelly-arms? 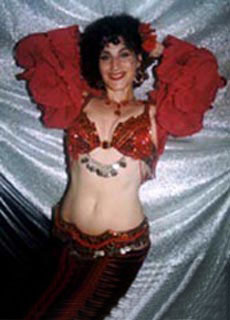 It seems to me the bare upper arm is a source of concern for costumed bellydancers second only to the tummy. As with any body part that causes a dancer to be self-conscious, my advice is to cover it beautifully and gracefully. No more anxiety. I'd first like to mention what NOT to do if you have large or soft upper arms. Don't wear snake armbands, fringed armbands, or any armbands because they tend to draw attention to the area rather than camouflaging the problem. Don't wear fitted gauntlets with tight elastic that cuts into the flesh, for the same reason. My solution for big arms is - big sleeves. The photo shows how pretty big sleeves can look on a cabaret costume. With my big sleeves on, my arm movements tend to be more flamboyant rather than subtle and snaky - an example of a costume part influencing one's dancing style. To the right, I've illustrated several styles of sleeves that are good for big arms. Full blousy sleeves, bell-shaped sleeves or ruffled sleeves like mine cover everything, and have a dramatic Gypsy flair. Choose a soft thin or semi-sheer fabric, perhaps with metallic threads or flecks. You might even cut the sleeves off another garment. See my article on sleeves for suggestions on how to make them. If your sleeves are gauntlets that are held up with elastic, try attaching the elastic to the sleeve edge only at two points — the seam and a point opposite the seam. This trick will hold up your gauntlets without revealing any indentation in the flesh, or bunching up the edge of the gauntlet. Another way is to actually tack the sleeve edge to the bra strap at front and back, leaving the shoulder bare. No elastic necessary. Your sleeves may also be part of a tiny bolero or ghawazee jacket like mine, and this will provide some coverage across your back too, if a bare back feels too revealing. The back of the jacket or the bottom edge could be decorated with tassels, coins, or scalloped trim for an Arabic look and be very charming. Thank you for your generous compliments, Waving-No-More, I hope this solves your problem. The photo to the right shows Shira wearing another example of full, puffy sleeves that cover the upper arm. These sleeves consist of rectangles of fabric larger than the circumference of the arm. They are gathered to cuffs at the upper and lower edges. Elastic is hidden inside the cuffs to hold them up. Photo by John Rickman Photography. Dancers who are self-conscious about their upper arms can follow this tip to reduce the amount of jiggle: If the choreography calls for the arms to be held outstretched to the sides in a "crucifix" position, do not point the elbows toward the ground, because this will increase the amount of upper arm jiggle. Instead, point the elbows toward the wall behind you! Click on the photo to the right to see more detail. Ask The Costume Goddess: Sleeve Variations. Several costuming ideas for the arms. The contents of this page are copyrighted 2008 by Dina Lydia. All rights reserved. Unauthorized duplication is forbidden.